Suppose we have an arbitrary black shape and an arbitrary black border. 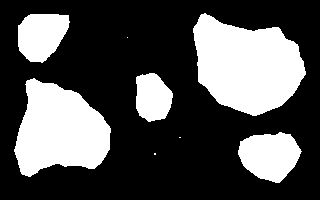 The shape is an "island"; it is surrounded by white. 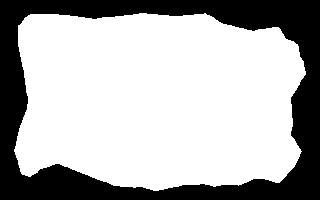 The black border extends to the image edges; it is a "mainland". Some shapes have a central point, from which straight lines can be drawn to every edge point without crossing the edge. In other words, from the central point we can "see" every edge point. How do we know if an image qualifies as an "easy shape? We could depolar from an assumed central point, scale this to a single line, then use a simplified version of graph1d.bat to scale it back up again. If the round-trip hasn't changed the image (much), then we have found a central point. Here is an easy island surrounded by an easy mainland. 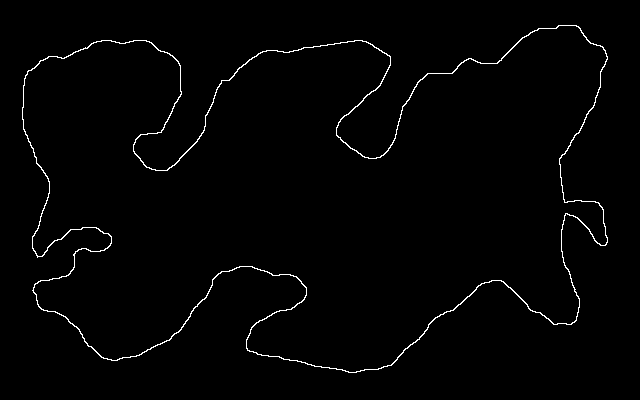 You can download is_easy.xcf, which has the island in one layer and the mainland in another. 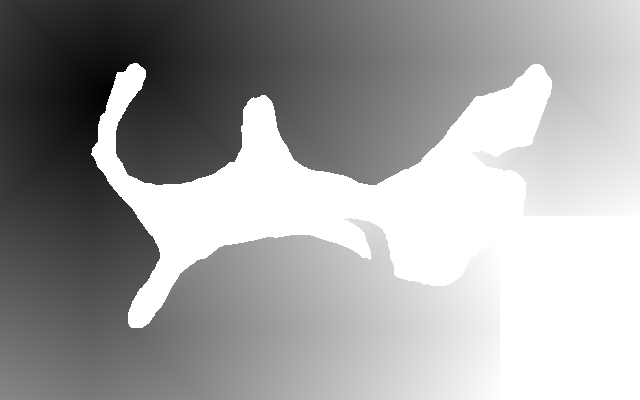 See Gimp and IM on how to extract the layers with extrXcfLayers.bat. 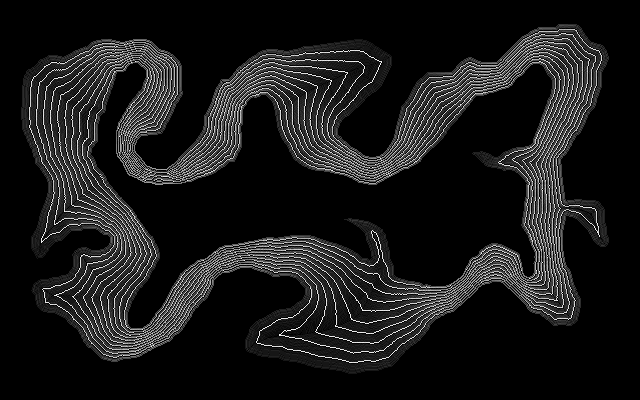 We can unroll using depolar, do any processing, and invert the distortion. Instead of drawing red lines, we might pick off boundary points and convert the coordinates back with data from "-verbose". Thus, we can find the correspondence between island points and mainland points. More usefully, we can displace vertically, eg to stretch the island out to the mainland. See Clut cookbook: Cluts from graphics for techniques. Some shapes have no central point. 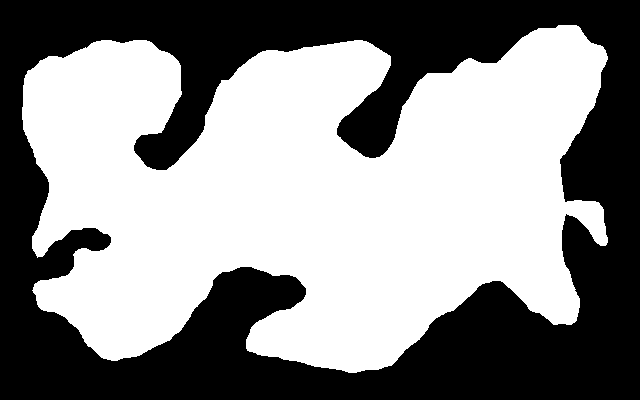 I made this image with Gimp, putting the island in one layer and the border in another. You can download is_src.xcf. A "morphology distance" on the flattened image would give us the distance from any land.  For morphing from one shape to another, we need something different: a smooth gradient from the island to the mainland. It should be exactly black where adjacent to the island, and exactly white adjacent to the mainland. This is not a simple problem. Here is a solution. and becomes lighter at distances away from the island. and becomes darker at distances away from the mainland. 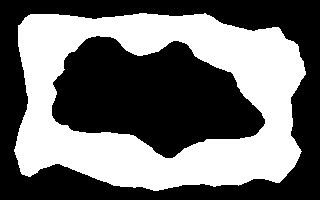 Merge the two gradients into one that is black at the island and white at the mainland. For fanComp.bat, see Composite compositions: Fan compose. though it is hard to judge from this image. Contours show successive stages of a morph between one shape and the other. 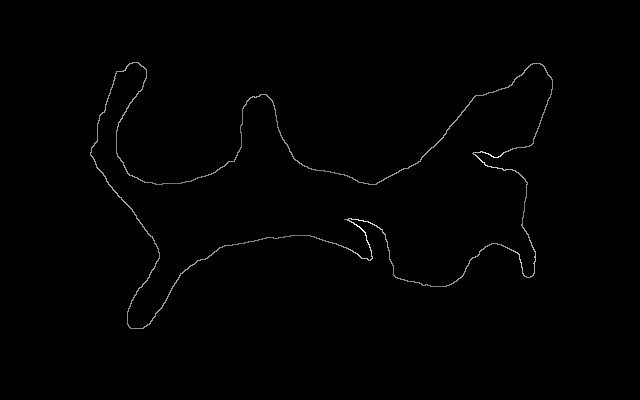 Show contours over the flattened image. 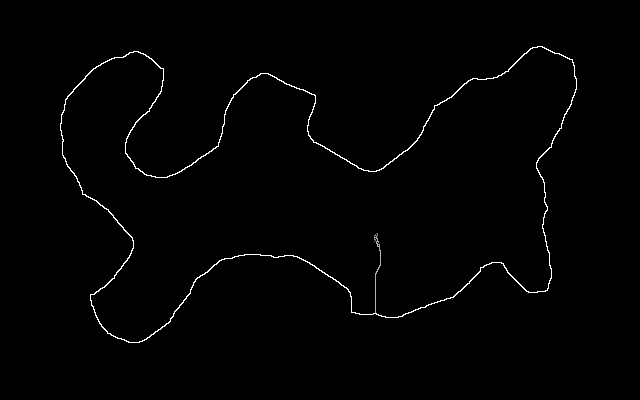 The contours are entirely between the island and mainland, as required. We find a centre-line between the island and mainland by reducing to a skeleton, and removing line ends. The centre-line will generally be different to the 50% gradient. See Anthony's Morphology of shapes: Thinning down to a Skeleton. make a thinner 8-connected skeleton. Removing these line ends doesn't work. remove line ends and then make a thinner 8-connected skeleton. See Anthony's Morphology of shapes: ConvexHull. Make a line at the edge of the mainland. 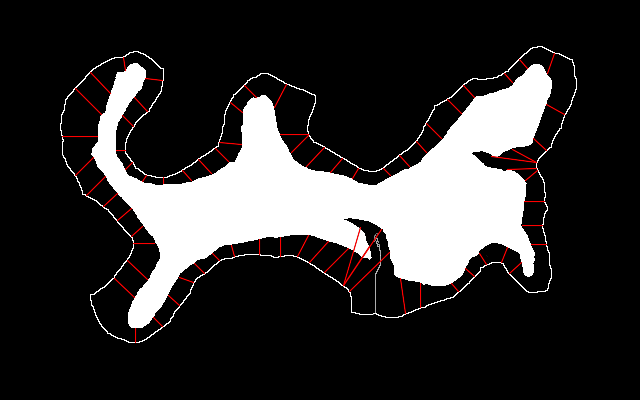 Pick points that are adjacent to the island. For highest precision we would use all the points. Instead, we pick a sample, using nLightest.bat. The indented lines are optional. They place greater emphasis on high-entropy locations. We use an exclusion radius of 5% of min(width,height). How many points did nLightest find? For each of these points, we can find the nearest point on the border (mainland). How? It is tempting to find a load of points on the mainland, and find which of these is closest to each island point. But distances will then cross the island. 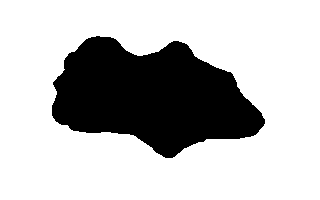 Instead, we put single black pixel on a white background, and use morphology IterativeDistance, masked by the island, to find distances from that point. Along the edge of the border, the lowest value found is the closest border to the point. 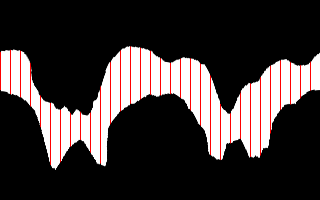 The integer after "IterativeDistance" is, ideally, the maximum expected distance. To show the process, let us find the closest border point to the coordinate (108,96), which is towards the top-left of the island. We write intermediate results purely for illustration. We should check that MIN is zero. If it is, we have a valid border point. The command above finds the match for one point. To find all matches, the script joinIslandMainland.bat loops through the points. 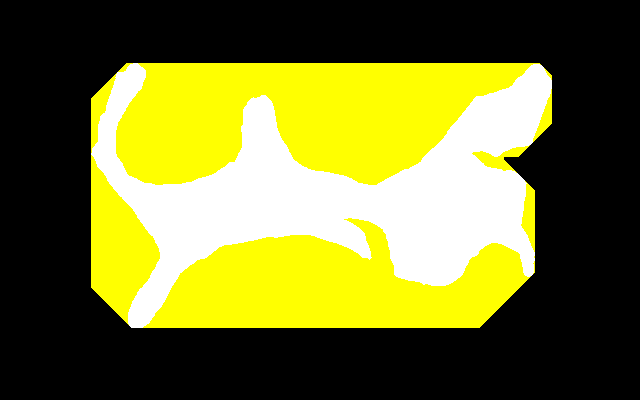 The script needs a white island on a black background, so we negate it first. Lines don't cross each other, which is good. Some lengths of island map to the same mainland point. Some lengths of mainland map to no island points. 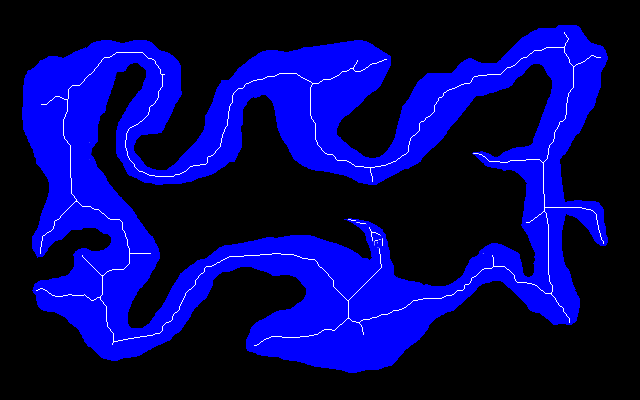 Some lines cross the island, for example bottom-centre and top-right. This happens when the mainland point is the closest one to the island point, even when the route has to go not in a straight line but around an island promontary. 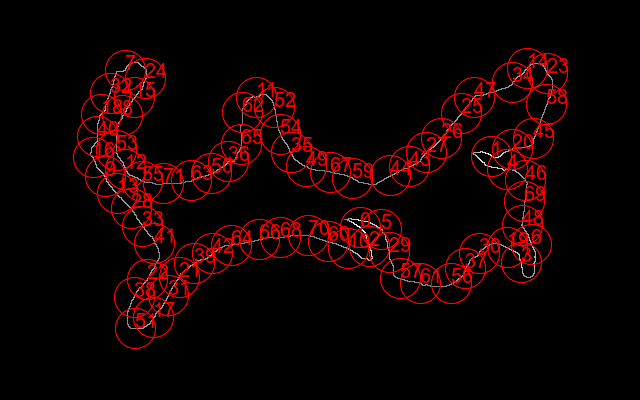 It is slow, finding about two lines per second. The first two undesirable features are unavoidable unless the island and mainland are exactly parallel. We can treat the centre line as a mainland edge, or (with a little initial processing) as an island. The "less desirable features" have been reduced but not entirely eliminated. We could iterate the process, dividing each distance into two, generating a (probably) very smooth transition from the island to the mainland. It is probably easier (and quicker?) to use the Gradient method above. This section was written before ImageMagick acquired the "-connected-components" feature. See the official Connected Components Labeling page. 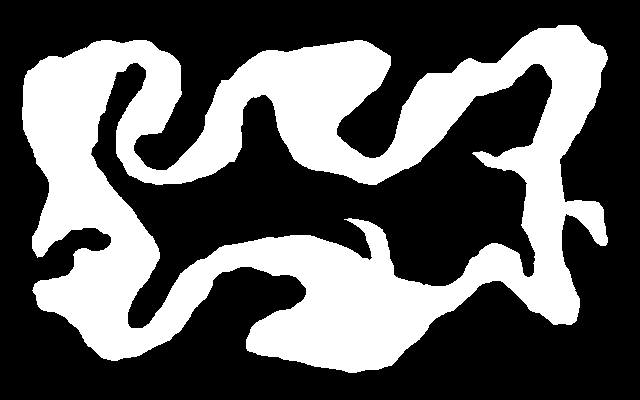 We sometimes have multiple "lakes", ie a number of white shapes on a black background.  This example includes five large and three small shapes. How many pixels in each? 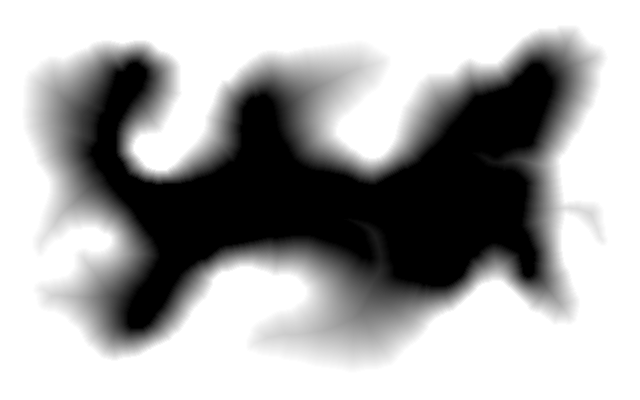 We start by reducing each shape to a single white pixel. If a shape was a ring, it would be reduced to multiple pixels. If the command had included "-morphology Erode Diamond", it would have missed the small shapes. We can walk through this list of coordinates. For each one, first find the number of pixels in the shape. Then we find the bounding rectangle. "Line Ends" is slow. If the shapes approach the size of the image and there aren't many of them, an alternative may be faster. 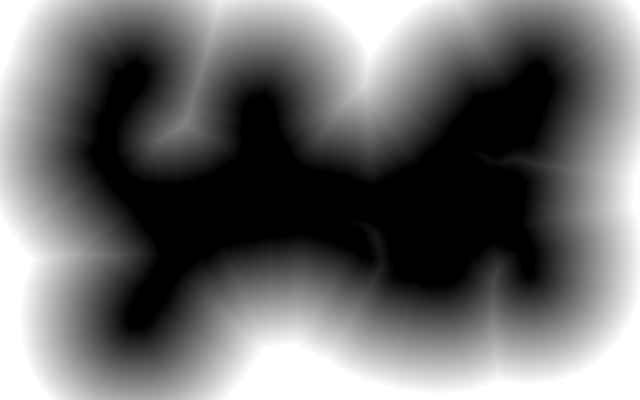 For example, the following finds a white pixel, flood-fills, and repeats until no more are found. As this needs a loop, we might as well do the other tasks (finding the size and bounding rectangle) at the same time. This has found the same sizes and bounding rectangles. It has found different coordinates but they are, of course, within the shapes. ASIDE: The commands just given use "sparse-color:" to list just the white pixels, and then pulls out the coordinates of the first one. When there are no white pixels there will be no coordinates, hence the test for !fxW! being blank. The test is then whether fwS is zero. If it is, then a white pixel was found. This method is much slower than using "sparse-color:". NOTE: After the above was written, a new feature was added to ImageMagick: "-connected-components". This is a very fast method for finding patches of connected colours. See the official documentation Connected Components Labeling. 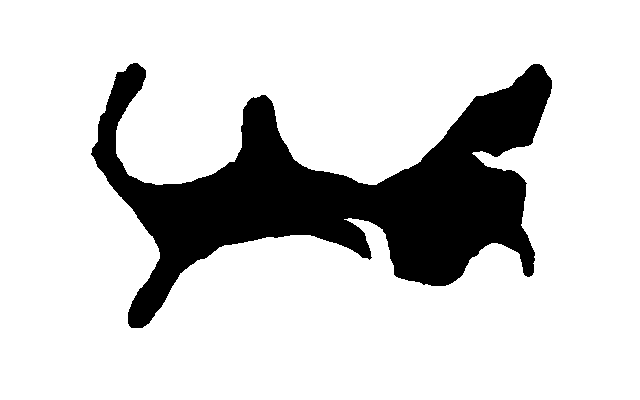 This has found nine components: the eight white shapes, and the black background. The centroid coordinates may not be within the shape. (For example, the centroid of a crescent-moon shape is not within the crescent moon.) From the results, a crop could be made of the bounding-box, and the crop searched for a pixel of the found colour. The techniques above are suitable when one shape is entirely within another. When shapes overlap, the techniques can be adapted by making another shape that contains all the others. This could be a circle, rectangle or union of the smaller shapes. Treat that enclosing shape as the mainland, and each overlapping shape as an island, and continue as above. See also Nearest coastal point and Correlating shapes (not yet published). 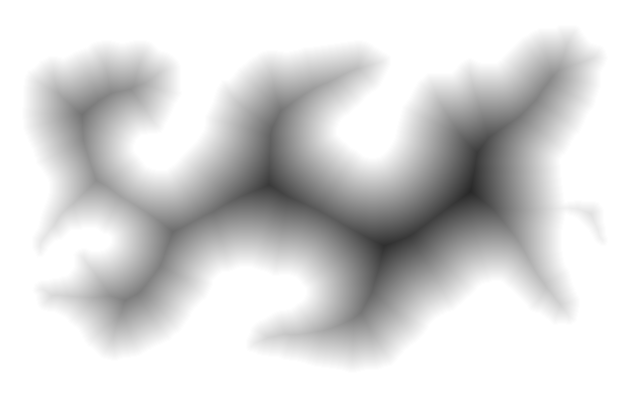 @rem From image %1, finds (%2) lightest points. @rem %3 defaults to 10 (percent). @rem Returns number of points found. Could be < n, or even zero (?). @rem   nlDEBUG if 1, creates debugging image. @rem   nlPOINTSIZE optional, pointsize for debug images. @rem      so finds only points that are exactly white. @rem   echos list of coordinates. @rem   24-May-2016 v7 needs -channel RGB for -auto-level. @rem   7-May-2017 "+antialias" the circles. See Composite compositions: Fan compose. rem A compose like a fan. rem Uses sparse-color and DOS tools; fast but messy. Source file for this web page is islands.h1. To re-create this web page, execute "procH1 islands".